On Sunday, my best little baking buddy (Leila) and I decided to make some cookies for our storytime friends. We've been going to storytime every Tuesday morning since she was just a few months old and have made a lot of great friends! I wanted to do a little something for them for Christmas, and after watching "Paula Deen's Cookie Swap" I was inspired! I just Heatherized (simplified) the recipe. The original recipe was to first start out making some pretty complex sugar cookies. 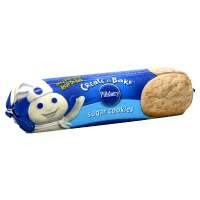 I opted for Pillsbury ready-to-bake cookie dough instead. I dyed one package of dough red, and one package of dough green. Placed the colors on top of each other, then rolled them into a log. I then chilled the log on floured parchment paper for two hours in the fridge. And bake for 15 minutes in a pre-heated 350 degree oven. I put each cookie in clear cello, and wrapped them up with festive raffia. They were easy and tasty and pretty darn cute if I do say so myself! you are so amazingly creative. I want to be like you when i grow up!! Love you! omgggggggg!!!!! loooove it! i wish you were my mom! I love Heatherized!! Those are so cute, and I'm sure all your storytime friends were so excited to receive them!